My husband, Dan, and I fear different things. I worry about global warming and whether each of our children is getting enough attention. Dan worries about the apocalypse and extraterrestrial invasion. (I read him the last line and he said, “Those aren’t things I fear, they’re things I’m preparing for.”) I worry that our children might be teased or bullied by other kids. Dan worries that our kids won’t be multilingual, karate black belts, who can program in Java with their left hand while playing the piano with their right hand. Anyway, between the two of us, we have most of our bases covered. And Jacob? He is a pretty upbeat, carefree kid . . . despite being the product of two reasonably neurotic parents. This is a child who spends about about half of each day singing a narrative about what he is doing. (Okay, the plot points aren’t always so thrilling, but I give him credit for carrying a tune. And occasionally rhyming.) But I digress. Jacob is four, so of course he does have some fears. Like wolves. Jacob loves animals. Loves, loves, LOVES them. When he’s not singing he is inevitably asking: “Mommy can we get a guinea pig? Mommy can we get a puppy? Mommy can we get a pet chick? Mommy can we get a puppy? Mommy can we get an iguana? Mommy can we get a puppy?” And on and on. Jacob is also fascinated with wolves. But once the sun goes down, he becomes terrified of them. “Mommy, can wolves get into our house?” “Daddy, is there a wolf in my closet?” I try to ease his fears. I explain that our house is safe. I tell him we would never let dangerous animals inside. I mention that we live in a city and there aren’t any wolves around. (Organized crime? Yes. Roving packs of wolves? Not so much.) He looks at me, dazed, his eyes sleepy and unfocused. “So, the wolves won’t get into our house?” No. And then there is the fear of witches. Over the past month, Jacob has been waking up in the middle of the night and coming into our room. Unfortunately, this is not so unusual for him. But now he’s panicked. He tells us there are “scary things” in his room. What sorts of scary things? Witches. At one point, Dan walked Jacob back to his room and was standing by Jacob’s bed, trying to coax him back to sleep when Jacob suddenly said, “Daddy, there’s a witch behind you! !” Now, I’m not judging and I’m not sayin’ these two things are related but : 1. Dan apparently found this “kind of freaky” and 2. Jacob has not yet been convinced that our house is witch-free. (You connect the dots.) Anyhoo, a few nights ago, Dan tried another approach. Jacob: Daddy, there’s a witch in my closet. Dan (waxing philosophical): So, Jacob, do you think witches are just people with green make-up on? Jacob (pause): Yes . . .? Dan: And do you think they buy their black clothes at the store just like we do . . .? Dan: And their brooms at Home Depot? With this Socratic process, Dan figured he had de-fanged Jacob’s fear of witches. Problem solved. Right? Now, again, I don’t mean to sound critical, but why not just go with: THERE IS NO SUCH THING AS A WITCH AND NO, JACOB, YOU DON’T HAVE ONE IN YOUR CLOSET. (Calm down, Wiccan folk: I’m sure you do exist.) By the by, the following morning, Jacob asked me, “Mommy, what’s a Home Depot?” Must. Squelch. Urge. To say. Witch Shop. The great thing about kids though is that they evolve at a much faster rate than adults. Yesterday’s fear is today’s conquest. For example, rock climbing. 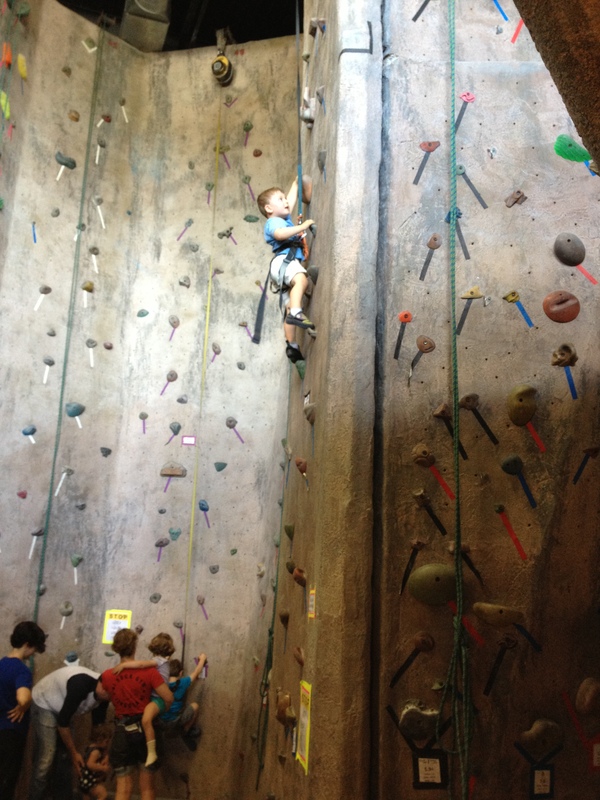 About a year ago, when Jacob was three, Dan thought it would be fun to take him to a rock climbing wall. Or, more precisely, Dan thought it was time for Jacob to begin acquiring the “life skill” of climbing the bald face of a mountain with his finger tips and toes. Okay, full disclosure (though I’m sure that last line sounded very diplomatic): I have a bit of an ax to grind with the whole rock climbing establishment. I went to a rock climbing gym once, excited to try out the sport after hearing rave reviews from friends. I got all harnessed up, ready for my big adventure. Then turned to the guy on belay and said, “Okay, I’m ready! Hoist me up!” He looked at me, confused, and then rather bluntly informed that I was supposed to use my (non-existent) finger and toe strength to haul myself up the damn wall. (Seriously? How exactly is that fun?) Anyway, I give Jacob credit for immediately seeing rock climbing for what it is. His first trip to the rock climbing gym lasted less than ten minutes. He was terrified, refused to go anywhere near the rock wall and that was that. This entry was posted in Uncategorized and tagged child's fears, rock climbing, witches, wolves. Bookmark the permalink. I laughed, I cried….truly! 🙂 I somehow don’t think Jacob would have liked “Crazy Hat Day” at Jesse’s camp this week when one of the counselors walked around in a giant witch hat!